If you’re planning a staycation to celebrate the upcoming public holiday, look no further than our top pick of UAE Eid destinations – all of which are offering a range of fantastic deals to mark the occasion. A welcoming escape from the hustle and bustle of the city, Manzil Downtown offers the best of both worlds – the comforts and convenience of modern life and simply authentic Arabian hospitality. In addition, guests can avail the hotel’s “stay more to save more” deal this summer. Stay for a minimum of 2 nights to enjoy 10% off best available room rate. Get up to 35% off when you stay for 5 nights or more at one of the hotel’s luxury suites. What’s more, U By Emaar members get additional Upoints for every stay. Check into any of the suites at the Shangri-La Hotel, Dubai and receive 10% off your room as well as a delicious, daily buffet breakfast. Guests can indulge in a relaxing treatment at CHI, The Spa and take advantage of the pool bar with AED 150 credit, in addition to having access to late check-out at 2pm. To top it all off guests staying in any of the suites have exclusive access to the hotel’s private Horizon Club Lounge for breakfast, snacks and evening drinks, as well as the exclusive Club leisure facilities on the 42nd floor. One&Only Royal Mirage have introduced ‘A Legendary Staycation’ package, available exclusively for GCC residents with rates starting from AED895 per night. Guests will receive 20% off best available rate, 25% off spa or oriental hammam treatments, guaranteed complimentary late check-out until 6pm, one complimentary candlelit yoga session and one complimentary Aquaventure pass per person, per stay. Over the coming Eid al-Adha holiday, the newly opened Grand Hyatt Abu Dhabi Hotel and Residences Emirates Pearl is offering the ultimate package deal with prices starting from AED900, inclusive of breakfast. Located at the renowned Abu Dhabi Corniche in the capital city, the hotel will treat guests to an upgraded room, complimentary pool access and AED200 F&B credit per day, valid at all dining outlets. 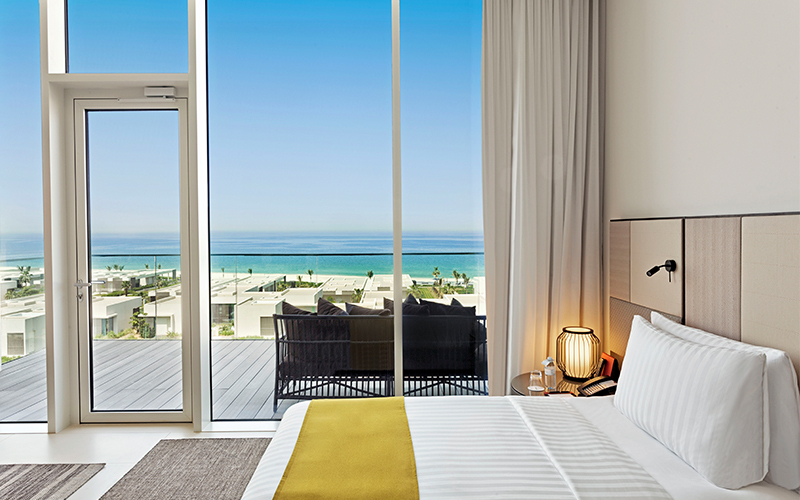 During Eid, guests will also have access to Saadiyat Beach Club. The St. Regis Abu Dhabi has announced three offers to celebrate Eid al-Adha with the whole family. Book into a Superior Room and receive a complimentary upgrade to a Sea View Room, AED200 restaurant dining credit, breakfast and a 4pm late checkout from AED700. Or, check into a Signature Suite from AED1400 – availing the same benefits. For families, book one room and save 50 percent on the second room; connecting rooms are available. Situated just 25 minutes from Dubai International airport, the all-encompassing resort of Al Zorah welcomes families and friends to relax, reunite and appreciate the true essence of the season. From just AED 1,400 per night, guests are welcomed to a spacious premier room, overlooking scenic views of the beach or poolside, from the comfort of an expansive private terrace. Guests can also enjoy a lavish breakfast spread for two at the resort’s in-house restaurant Vinesse, whilst taking advantage of uninterrupted panoramic vistas of the property. Details: Valid until 25th August 2018, and all bookings are based on a minimum two nights stay. To book, call +971 650 44888. To read more about when BBC Good Food Middle East visited Al Zorah, check out the review here.